Disodium etidronate (EHDP) was used in clinical trials to study its effectiveness in preventing the recurrence of mineralization after surgical removal of heterotopic ossification in spinal cord injury patients. Four patients with hip ankylosis had seven surgical wedge resections on a controlled, or double-blind, study. Wedge resections without EHDP treatment prevented recurrence as long as the drug was administered, up to 39 weeks. After discontinuation of EHDP therapy, recurrence was variable but was less than expected. EHDP is the first therapeutic agent that may delay and partially prevent postoperative heterotopic ossification recurrence. Heterotopic ossification can be classified in three forms: (1) Neurogenic heterotopic ossification, which occurs with severe neurological conditions; (2) traumatic myositis ossificans, which occurs after direct muscle trauma or other types of tissue injury; and (3) myositis ossificans progressiva, a congenital form of unknown etiology. 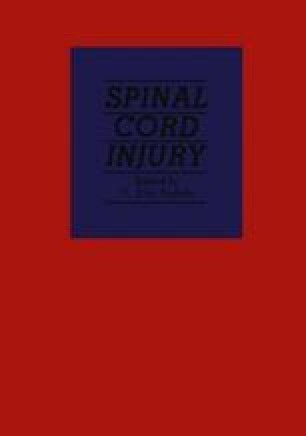 Following spinal cord injury, neurogenic heterotopic ossification is reported to occur with an incidence ranging between 16% and 53% (Venier and Ditunno, 1971). Prospective roentgenogram surveys have shown that the hip joints are most frequently involved, followed by knees, shoulders, elbows, and spine (Stover et al., 1975). It appears most frequently one to four months after injury but has been detected as early as 19 days or, rarely, several years after injury (Hardy and Dickson, 1963). Ossification may be minimal, identified only as coincidental roentgengraphic findings, and may have no clinical effect in a majority of patients. With more extensive ossification, severe limitation of motion and ankylosis occurs in about 3% of all spinal cord injury patients (Wharton and Morgan, 1970). Therefore, in spinal cord injury patients who develop any degree of heterotopic ossification, ankylosis may develop in 8–20% secondary to the size of the mass or its relationship to a major joint (Hardy and Dickson, 1963; Wharton and Morgan, 1970). Restricted joint motion, or deformity, may cause further functional impairment and skin breakdown, limiting rehabilitation goals; therefore, the patient may benefit from operative intervention. The early clinical appearance of larger masses of heterotopic ossification are characteristic of any soft tissue inflammatory reaction. The extremity, within a short period of time, becomes warm and swollen, and fever may occur. Within several days, a more localized, firmer mass is palpable within the area of edema with a gradual decrease in passive range of motion. An elevated serum alkaline phosphatase may be of value in differentiating early heterotopic ossification from other clinical entities (Nicholas, 1973). Early calcification often is not seen on routine roentgenograms for seven to ten days after clinical signs have appeared. Radioisotope bone scanning may be the only definitive method of early diagnosis (Rossier, 1975). The etiology and pathogenesis are still unknown. An inflammatory — type reaction causes connective tissue edema and cell metaplasia with immature-appearing connective tissue, chondrogenesis, and osteogenesis (Rossier et al., 1973). Mineralization of the tissue involves an amorphous calcium phosphate phase, which is gradually replaced by enlarging hydroxy apatite crystals. This leads to the formation of lamellar corticospongiosal bone. The process usually arises at the periphery of muscle, gradually becoming distinct from the main muscle mass, but occasionally has atrophic muscle fibers incorporated within the bony mass. The joint space and capsule are preserved as bone forms in periarticular areas adjacent or more distal to the joint in predisposed areas.